Using the Hubble and Spitzer Space Telescopes, astronomers discovered one of the most distant galaxies known – Abell2744 Y1. The findings, led by astronomers from the Instituto de Astrofísica de Canarias and La Laguna University, are accepted for publication in the scientific journal Astronomy and Astrophysics Letters. 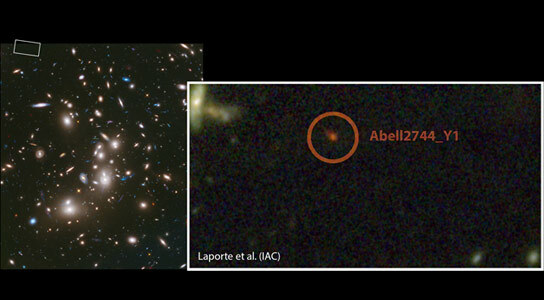 Be the first to comment on "Hubble Views Abell2744 Y1, One of the Most Distant Known Galaxies"